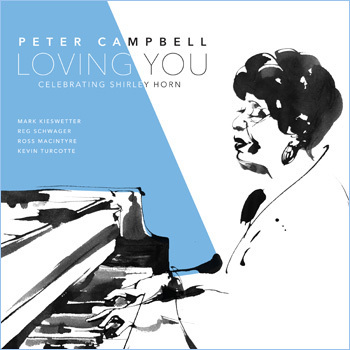 It’s not hard to fall in love with Shirley Horn all over again when you listen to Loving You by Peter Campbell. Such unabashed worship as is lavished on Miss Horn in each of these thirteen songs is completely understandable. Shirley Horn was a goddess who walked the earth in all of our lifetimes. Hitherto, the pianist Ezra Weiss had made the most compelling homage to Mistress Horn (surely she warrants that moniker). That brilliant recording featured the wonderful vocalist Shirley Nanette on four ineffably beautiful songs as well as Miss Horn’s long-time drummer Steve Williams. This recording by Peter Campbell features no drummer, but it does have the incredible Reg Schwager gracing all the tunes as he plays electric and acoustic guitars along with Mark Kieswetter on piano (and as musical director as well), with Ross MacIntyre on contrabass and Kevin Turcotte on trumpet, to round out the quintet. All of the musicians are stars in their own right and could easily have produced extraordinary Shirley Horn tributes by themselves. But here it’s the time of Peter Campbell. There are, quite simply, few vocalists who can sing counter-tenor like Mr Campbell does. This sounds somewhat higher in register than Miss Horn used to sing, so one is a bit taken by surprise when Mr Campbell’s voice soars gloriously on the opening bars of “A Time for Love”, especially for the listener who, like me, has not heard Mr Campbell sing before. And then the muted wail of Kevin Turcotte begins as the first solo is taken. Perhaps it’s best to say that this is Shirley Horn with bells on… and yet it is not simply well-loved music by an icon in festively re-orchestrated guise. Still it bears mention that the search for authenticity in performing Miss Horn is so firmly established that it seems quite perverse to regress to what the Great One certainly didn’t intend. Yet, in the numerous examples that exist – retaining Shirley Horn’s harmonies (and this should also include Mark Kieswetter, simply because Miss Horn accompanied herself as she sang) and, secondly, elaborating and enriching them. Yes, such a thing is and Peter Campbell does bring both these features to the music that Shirley Horn made her own. Both Peter Campbell and Mark Kieswetter (in their roles as performers and arrangers) call on wonderfully imaginative orchestral techniques: on songs such as “Loving You”, for instance, with just piano and Peter Campbell’s phrasing of the words with an almost exaggerated vibrato to make it clear that this isn’t expressing something familiar to himself, but almost proclaiming an epistle as Shirley Horn wrote it, and moreover – just as importantly – as how Peter Campbell experiences and lives it, which is just as critical to the beauty of that song. But there are other things that are equally alluring to the piano and the voice. Reg Schwager is a voice quite singular and astonishingly well-controlled. A master of crafting both his own visage as well as a shadow behind a vocalist (remember all that brilliant work he has done and continues to do with Diana Panton). And then there is Ross MacIntyre’s luscious-toned bass which also makes no concessions of tempo, yet still dwells in the lightness and delicacy of being. While he does nothing to overpower his musicians, Peter Campbell he does purify the glory of Shirley Horn as it does “shake the heav’ns and the earth”…What more could one ask for, really. Track List: 1: A Time For Love; 2: Sharing The Night With The Blues; 3: Loving You; 4: There’s No You; 5: Wild Is The Wind; 6: Forget Me; 7: I Watch You Sleep; 8: The Great City; 9: The Sun Died; 10: If You Love Me; 11: Something Happens To Me; 12: So I Love You; 13: You Won’t Forget Me. Personnel: Peter Campbell: vocals; Mark Kieswetter: piano; Reg Schwager: electric guitar, acoustic guitar; Ross Macintyre: contrabass; Kevin Turcotte: trumpet.